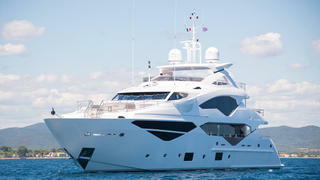 The 40.05 metre tri-deck motor yacht Jacozami has been sold with the buyer and seller introduced by Moana Yachting. Built in GRP by British yard Sunseeker International and delivered in 2016, Jacozami features a semi-displacement hull and was styled inside and out by the Sunseeker International team. Triangular hull windows give her a distinctive appearance and allow plenty of natural light to penetrate the superstructure. On the main deck, Jacozami is split into three main zones: a casual lounge, formal dining area and the master suite, which stretches across the full 8.09 metre beam. Power comes from a pair of MTU diesel engines, which give this 189.6 tonne yacht a top speed of 25 knots. When trimmed back to 12 knots, the 21,560 litre fuel tank allows for a maximum cruising range of 1,500 nautical miles.